Meeting NanoEuroMed - 2011 will gather the leading scientists in Multifunctional Nanomaterials from different Partner Poles of the European Community with objective to consolidate the research efforts around the EU technological space. Researchers from EU, East Europe and Mediterranean countries will present the recent advances in processing, structure, properties, modeling and applications of multi-functional nanomaterials and technologies. Special emphasis will be given to the participation of young researchers and PhD students..
Meeting will be held under the auspices of Mediterranean Institute of Fundamental Physics , National Academy of Science of Ukraine, network Mediterranean Electronic Materials and FP7-IRSES program SimTech, involving Kurdyumov Institute of Metal Physics in Kiev, Caddy Ayad University of Marrakech and Uzhgorod S&T Center of the Institute for Information Recording. Conference city - Uzhgorod is located in junction of the East and Central Europe where Ukraine, Slovakia and Hungary borders cross. This historical and multicultural town have its own airport and is easy-accessible from international EU airports in Budapest (Hungary) and Kosice (Slovakia). It is also related by train connections with most important East- and Central Europe towns. No visas are required for EU citizens. 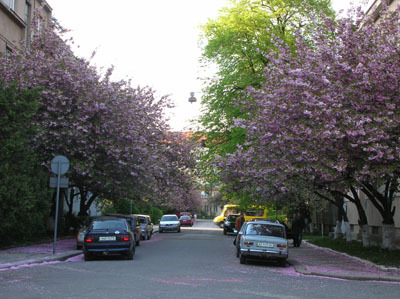 Conference will be held in the most picturesque forest recreation area of Carpathian Mountains in the best spring period of cherry (sakura) blossom. The exchange of ideas about future collaboration in friendly atmosphere of Round Table session and dialog of scientists from countries with different research culture will stimulate the creation of Pan-Eropean scientific and academic links and projects.